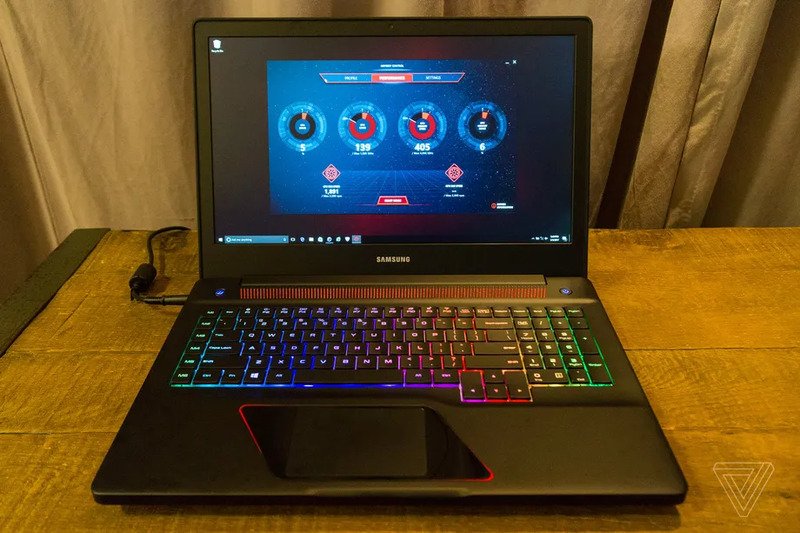 Gaming laptops are one of the things that every PC maker has prioritized at this year’s CES, with big names like Lenovo, and now Samsung, starting whole new sub-brands of gaming PCs. Samsung’s answer to Lenovo’s Legion is the Notebook Odyssey. The Odyssey begins with a 15-inch laptop in February and a 17-inch behemoth in April, both of which look like rejects from Alienware’s design interns. There’s an upsettingly high degree of unoriginality about these laptops, which could easily bear Acer’s Predator or Asus’ Republic of Gamers branding — they’re both cookie-cutter gaudy monstrosities. Like Lenovo, Samsung is introducing a red-backlit keyboard on its lower-tier model and a multicolored keyboard on its higher-end laptop. Like a neophyte gaming PC maker, Samsung eschews high-end materials for a massive dollop of hollow plastic: I found flex both in the top lid of the Odyssey 17 and in the keyboard itself. A lot of flex. Samsung’s hinges on both Odyssey laptops are flimsy, nothing approaching the hydraulic motion of, say, Lenovo’s ThinkPads. But the most offensive thing about these laptops is how gaudy they are. There’s a ridiculous glossy plastic surround that sits on either side of the touchpad, highlighted by LED lighting. It’s attractive only insofar as it inevitably attracts the eye — but it’s mindless decoration for absolutely no user benefit. The Odyssey 17 also has a "Beast Mode" button above the keyboard — which Samsung at least promises to rename before releasing the laptop — and that flips the switch to turn on max performance mode in the included Odyssey Control software suite.